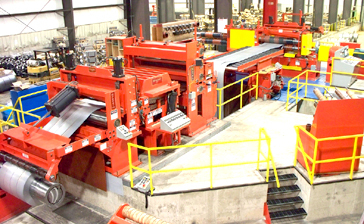 Walworth, WI - Dalco Metals, Inc, a flat rolled steel distributor and coil processor installed a new high-performance Double-Loop Turret Head™ Slitting Line equipped with a Shape-Correction Cluster Leveler™ in its newly expanded Walworth, WI facility. 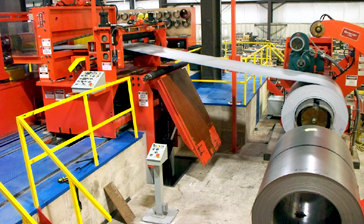 The new line has the ability to slit and shape correct 50,000# x 65" wide hi-strength HR pickled, cold rolled, and galvanized carbon steel coils in gauges from .187" through .010" at processing speeds to 1,000 FPM. Dalco Metal's new Turret Head™ Slitting Line equipped with a Computer Controlled Cluster Leveler™ produces precise tolerance slit coils while correcting edge-wave, center-buckle, and cross-bow strip shape defects. The new Slitting Line joins a Braner 1/4" Turret Head™ Slitting Line and a Braner 1/4" x 72" Hydraulic Cassette Leveler Servo Feed CTL in Dalco's Walworth, WI facility. Multiple Operating Modes: The new line allows Dalco Metals to choose from four (4) processing modes: Double-Loop; Single-Loop; Push-Pull; and Tight-Line; and to process coils using the mode that generates the highest quality product. Surface-critical thin gauge coil can be processed in a Double-Loop mode where the Uncoiler drives the strip into a free-loop. This mode processes coils with zero back-tension and eliminates Slitter tooling slippage that could cause surface scuffing. Single-Loop mode can be employed for processing mid-gauges, and a Tight-Line can be utilized for edge trimming and full coil shape-correction. A Push-Pull mode is ideal for heavy slitting loads with hi-strength heavy gauge coil. The Uncoiler is equipped with a large loop-control DC motor that can be used to generate back-tension or to drive the strip into a free-loop for tension-free unwinding. A sonic loop sensor, Pinch Rolls, pushbutton adjustable Side Guides, Automatic Edge Guide, and Crop Shear are mounted on the compact Entry Table. Pushbutton Tooling Lock-Up Turret Head™ Slitter: Dalco Metals' new Slitting Line includes a 9.000" x 200 HP Turret Head™ Slitter equipped with a Pushbutton Tooling Lock System that secures slitter tooling onto the arbors via pushbutton. The elimination of threaded lock nuts reduces re-tooling time by making the job quicker and easier while eliminating arbor and lock nut thread maintenance. Dalco Metals' Turret Head™ Slitter is equipped with two pushbutton tooling lock-up slitter heads supported in massive one-piece stress-relieved and precision machined solid steel housings. The unique design results in a precise machine that produces ultra-precise slit width tolerances. Reliability is bullet-proof. Note that the slitter heads at the "set-up" station are completely exposed and readily accessible with no housings, bases, or frames in the way of the set-up person. Free and clear slitter head access and quick head exchange ability gives Turret Head™ Slitter users the ability to make more set-ups and head changes per shift than with any other multi-head slitter or tool transfer device. Turret Head™ Slitters are equipped with multiple "integral" slitter heads that do not detach and uncouple in order to change heads. The unique design makes Turret Head™ Slitters more rigid, more precise, and more reliable than any other multi-head slitter or tooling transfer device. 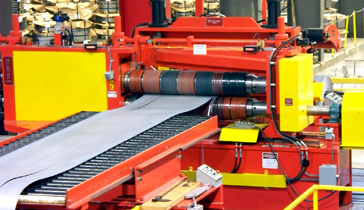 Strip Tensioning: The Slitting Line is equipped with two (2) strip tensioning devices: a Pad Tensioner and a patented Non-Marking "Duplex" Roll Tensioner. 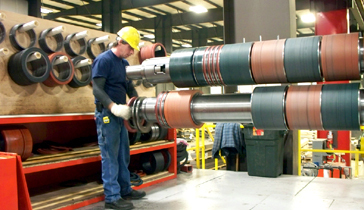 The Pad Tensioner is employed when slitting non-critical surface coil, and the Duplex Roll Tensioner is utilized for critical surface coil. Both Tensioners are designed for minimal order changeover down-time. The Pad Tensioner allows friction pads and strip separators to be exchanged in less than 60-seconds. The patented Duplex Roll Tensioner is equipped with two (2) independent job specific sets of Tension Rolls that can changed from one job to the next depending upon coil surface finish and gauge. Tension Rolls are exchanged in one-minute by pushbutton.